Les Levidow overviews the attempts to normalise and integrate IHRA, and offers some strategic observations. Acknowledgements: This article extends the author’s talk at the IHRC conference, ‘Islamophobia and Silencing Criticism of Israel’, 15 December 2019. It was published in the January 2019 Newsletter of the British Committee for the Universities of Palestine (BRICUP). [Published in the IHRC website, 2 February 2019, download the PDF here] With the increasing mobilisation of Far Right forces in recent years, antisemitic attacks have become a more serious threat. However, a high-profile campaign has disgracefully targeted an ‘antisemitism problem’ in the Labour Party and the wider Palestine solidarity movement. For nearly three years, the movement has been countering the false allegations. In the intimidation campaign, a key weapon has been the so-called ‘IHRA definition’, misnomer for a long document. Although the short definition was approved by an IHRA meeting, its website subsequently posted a long guidance document that lacks endorsement by any international body. The long document has 11 examples, 7 referring to Israel, some conflating antisemitism with criticism of that state. 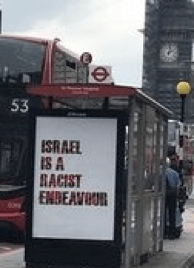 In particular, it is supposedly antisemitic to describe the Israeli regime as ‘a racist endeavour’; consequently, the phrase ‘apartheid Israel’ becomes a taboo. On this basis, the guidance document has served to censor speech and deny venues for events, especially in universities during Israeli Apartheid Week. 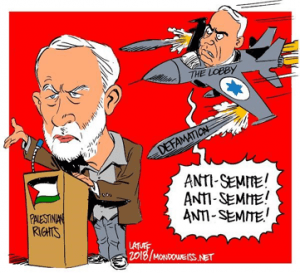 Efforts to counter the intimidation campaign have been informed by Jewish-led pro-Palestine groups, especially Free Speech on Israel and more recently Jewish Voice for Labour (see References). What drives this agenda? A deeper explanation is suggested by an article by the SOAS academic Sai Englert (2018): ‘Jewish communities in Britain are being directly mobilised as a shield, behind which the government can hide to defend its own trade and international-policy choices, while also undermining political freedoms in the UK.’ This state-led agenda extends a long history of racializing colonial peoples abroad and ethnic minorities in the UK. A century ago, Jews were demonised as a danger to Britain’s Christian culture. Indeed, before and during the Nazi regime, many Jewish refugees were blocked by Western states. the Labour Party’s NEC adopted the IHRA document with all the examples. Bouteldja, H. 2015. State racism(s) and philosemitism or how to politicize the issue of antiracism in France? Englert, S. 2018. Judaism, Zionism, and the Nazi genocide: Jewish identity formation in the West between assimilation and rejection, Historical Materialism 26(2), Identity Politics special issue.